The Town Hall and Roland on the Marketplace of Bremen represent the civic autonomy and market freedom during the Holy Roman Empire. Both Town Hall and Roland are prominently placed on the marketplace of the Hanzestadt Bremen. 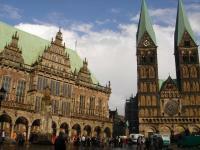 Bremen today still is an autonomous federal land, situated in north-western Germany. The Old Town Hall was built in 1409 and renovated in the 17th century. It was especially designed to act as a Town Hall, and used this way over the ages. 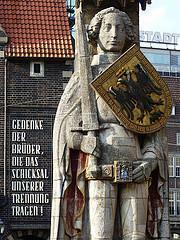 The Roland statue is 5,55 meter high and dates from 1404. It stands in front of the Town Hall, but faces sidewards to the church. Roland statues can be found in a number of German towns, they represent market rights and freedom. An easy drive of a little over 3 hours took me to Bremen. It's quite a pleasant city, not too big, nothing spectacular also. 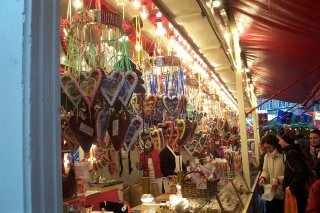 The old center still is its heart, which this time of year results in a big Christmas market on the old market place. 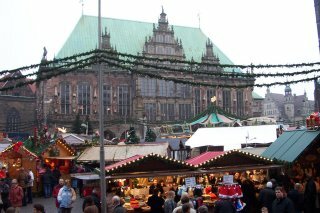 The people of Bremen (and a lot of foreign guests) were clearly amusing themselves on drinking Glühwein, eating Bratwurst and shopping for Christmas decorations. I was most interested to see the Roland statue: a real phenomena of Northern European culture. There's a Roland in Riga (Latvia), where I was earlier this year. Bremen's Roland is supposed to be one of the best, but today it was almost hidden between the Christmas stalls. Difficult to get a good look at him this way, but some details do stand out. He has very pointy knees for example! There's some discussion about the worth of this site as a WHS. The old Town Hall survived the Middle Ages (and WWII) quite intact, which is remarkable for German monuments. Its architecture though is very common in The Netherlands and Belgium. And poor Roland: not much of him is original. Even his head was replaced in 1983. I'm so glad that I organised a tour to go inside and see the Town Hall - you really can't appreciate this WHS if you only look at it from the outside. The roland and the town hall are very pleasant fro the exterior, however. Inside you get to see some of the original rooms and the role of the town hall in history becomes clearer. It wasn't used in the way we think of town halls - it was the epicentre of all the business and politics (back then, mixed) with guilds and merchants and nobility. The decorations with the maritime motifs and all the relevance to guilds is really interesting. The highlight for me was the large meeting room on the second level at the front. I visited this WHS in October 2014. I travelled by car and as usual indoor parking lots in Germany are cheap and easy to find close to the main landmarks. I knew that there wasn't going to be much too see in Bremen so I decided to spend a day there and then sleep in Lubeck. It turned out to be a very wise decision as there's much more to see and experience in Lubeck. I was expecting much more from this WHS. Although the town hall and Roland statue are worth seeing, I didn't think they offered any OUV. 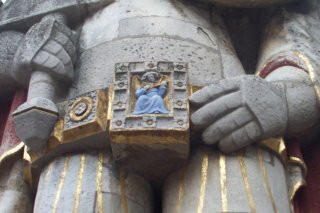 The Roland statue is nothing special compared to others such as in Dubrovnik or Riga. The town hall is pretty and the Market Square is quite similar to the main square in Antwerp, Belgium. The true gem in Bremen is Böttcherstraße although it is always crowded with tourists. I'm glad I visited Bremen but I'd say it's more of a national heritage town than a WHS. It may not appeal to everyone, but there is something about Bremen that charms the socks off of me. It is a great little city and if, like me, you spend a fair bit of time eyeing up budget airlines flights for weekends away in Western Europe then I would say there are few places that could better Bremen for a quick trip. The WHS itself is still merely "good and representative" however it is a lovely part of the small historic centre of the city. The real highlight for me is the magnificent Böttcherstrasse, which could be a good quality addition to the world heritage list in its own right. This art nouveau jewel seems to not receive the recognition it deserves, to my mind it is one of the prettiest streets in the whole of Europe. Added to this is the charming Schnoor district, the riverside location, a fine ensemble of bars and well connected infrastructure which make it a rather nice place to spend some time. It was also one of the best places I have spent New Years' eve, though as a warning I wouldn't get on a cruise for that evening as the boats seemed to become a moving target for fireworks. The World Heritage Site is nothing special; however 3 visits to this city have kept on reaffirming my love of it. It may not top everyone's must see list but it has always been exceptionally charming to me and any excuse to head back for another batch of Kluten wouldn't be turned down. My wife an I stayed in Bremen Sept., 2009 for ten days. The Marktplatz area is very nice. The statue of Roland is impressive. Bremen's oldest church of about 1,000 years is in the Marktplazt along with other old buildings. 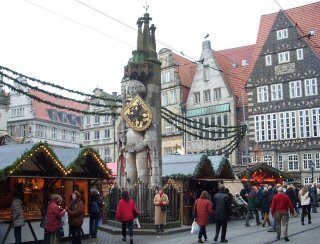 Nearby is the Weser River with activities of the boat parade, river cruises and a flea market on weekends. The Hauptbanhof train station is nearby also. It is easy to walk around Bremen. If you don't pay the tram fare and are caught you could be fined 40Euros(about USD60. Trams are nice and clean. Our purpose was for genealogy. My ancestors come from the Beverstedt&Dorum towns. In the area we visited there are huge tracts of peat moss that runs up to 3-4 meters deep. We went to Dorum which is very close to the North Sea. There are many windmill electric generators in the area. Bremen is an interesting town to visit. Traffic was not bad, but renting a car(Ford Fiesta)is about USD125.00 per day. Fortunately, we had an excellent genealogy guide who did the driving. This was our second trip to Germany. A few years ago we visited south Germany near Strasbourg. Knowledge of German language would be very advantageous because signs are all in German and not a lot of people speak English. Bremen, a small city state in northwestern Germany, is a great surprise for me, there are many things to see and do in this small city which has long interesting history. As part of Hanseatic League, the city has many similarities to other hansa towns, but the main difference between Bremen and other towns is Bremen can preserve its status as a free city state and able to preserve its historical core quite intact making a great contrast to Hamburg which has transformed itself to become a modern European port city. In the past, Bremen, as a city state republic, had its own administrative functions and its centre of power was the famous town hall in the old town, a UNESCO World Heritage Site. 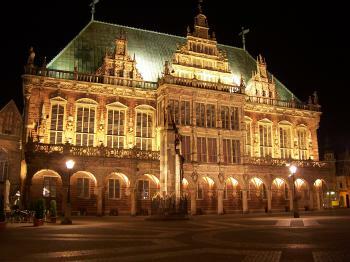 A beautiful Weser renaissance town hall is deservedly to be a star attraction of Bremen and particularly in this region of Germany. Unfortunately, the town hall was closed for some civil ceremony, so I did not have opportunity to see inside the town hall. I just wandered around the building, a similar activity for most of tourists who come to Bremen. The town hall looks stately and can easily be a great symbol of Bremen's continuity of freedom like a Doge Palace in Venice. 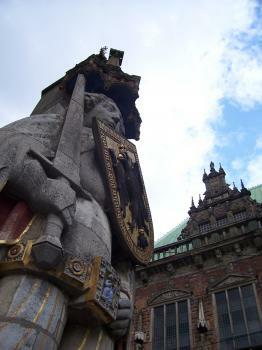 The Roland statue, a protector of trade, in front of the town hall is quite big enough to get everyone's attention. The statue is OK with lovely decoration; I really liked the golden shield with the eagle of Roland. Bremen can be a nice trip to everyone. The town hall, Beck Brewery, Weser Stadium, charming old town and its people, or even a windmill will make you enjoy the orange and green spirit of Werder Bremen and a nice taste of this former great city state. As a side tour to my visit to the CeBit-fair in Hannover, I headed for Germany’s latest World Heritage Site on a rainy day in March 2004. Having walked around the old city of Bremen and also visited the chatedral of St.Petri, located next to the Town Hall, it was time for a guided tour of the main attraction. I was obviously in luck and since no one besides myself wanted to join the English tour, I got my own guide, showing me the beautiful and historic interior of “Das Rathaus”. After the tour I slided down in the Rathaus Keller for a relaxing lunch before heading back to Hannover. I really enjoyed my visit to Bremen, it turned out to be a very charming city, with much to warrant a visit. The World heritage site itself I am still unsure about though, The Town Hall is very impressive and sits on a very lovely square which contains the statue of Roland. The statue is nice, and represents the city’s place in the Hanseatic League. Whilst these are both very nice I am not sure if they are really of ‘Outstanding Universal value’. They are representative of many similar places in Europe and I guess this was the reason for inclusion. But anyway my experience of Bremen was far from negative; in fact it was a real delight of a city. Aside from the elements of the World Heritage Site the most impressive site was Böttchersraße, which runs from the Market Square to the river, it is one of the finest pieces of Art Nouveau architecture anywhere in Europe. We loved it especially as we were lucky enough to see the fantastic Himelsaal at the top of the magnificent spiral staircase in Haus Atlantic, now the Hilton. The Schnoor area is a delightful mess of narrow lanes with some great shops, especially Atelier GAG which sells paper models. Am Wall is a lovely Park next to the former moat is a lovely place for a stroll and sit down. The Schlachte is a nice riverside area with bars and restaurants. Bremen was a very nice city and well worth a visit, especially as its airport is one of the best located for the city centre, being only 15 minutes from arrivals to the main square. Despite the fact I feel the site it is not of ‘Outstanding Universal Value’ it was a really great city to visit and one that I could thoroughly recommend. 2.5: Ivan Rucek Solivagant Peter Loov Ian Cade Svein Heltberg Martina Ruckova Alias65 David Berlanda Tony H. Frederik Dawson RobRos Clyde Peter A. 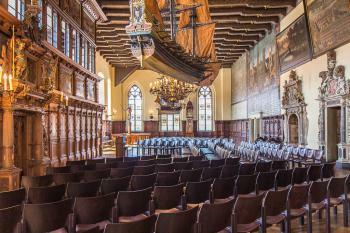 Oldest companies: Ratskeller Bremen, the council wine cellar of the Town Hall of Bremen. Erected in the year 1405.